The Continental 4x4 Sport Contact has been brought to the market for the high performance 4x4 vehicles on the market. With excellent handling and grip the tyre will retain control in wet and dry conditions.The 4x4 Sport Contact is designed for 100% road use.You will find the 4x4 Sport Contact as the original tyre on the Range rover sport, Volkswagen Touareg and the Porsche Cayenne.The 4x4 Sport Contact is also suitable for other vehicles. 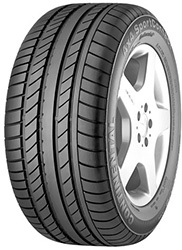 With excellent handling and grip the tyre will retain control in wet and dry conditions.The 4x4 Sport Contact is designed for 100% road use.You will find the 4x4 Sport Contact as the original tyre on the Range rover sport, Volkswagen Touareg and the Porsche Cayenne.The 4x4 Sport Contact is also suitable for other vehicles.